There are few cars that conform more closely to the saying ‘there’s no replacement for displacement’ than the Dodge Viper. The all-American brute has never come with fewer than 10 cylinders and eight litres since the original SR 1 arrived in 1991. Of course, all those cubic centimetres came at a price: the V10 alone weighed 323kg and gulped fuel like an addict, yet maximum output didn’t surpass the 500hp mark until the turn of the century. Still, you could never describe a Viper as cumbersome. That was the case from the very start, when Dodge built its two-door performance machine around a tubular steel chassis and fibreglass body, countering that enormous motor just enough to keep the kerbweight under 1,500kg. This gave the car a power-to-weight ratio of 268hp per tonne, which was actually 62hp/tonne better than the much smaller Ferrari 348. Sure, the Viper’s advantage ended with the straights, but it was far from a slouch around the corners. Evidence of its underlying prowess came later in the ‘90s when racing specialists Oreca of France and Reynard Motorsport of Britain were called upon to create the GTS-R Le Mans car. The competition model raced under a factory outfit at the famous 24-hour race for three consecutive years from 1998, winning its class on each go to cement it amongst GT legends. So competitive was the racer that the Mk1 GTS-R continued to race in endurance events the world over with privateers deep into the 21st century – and some original chassis are even still in use to this day. 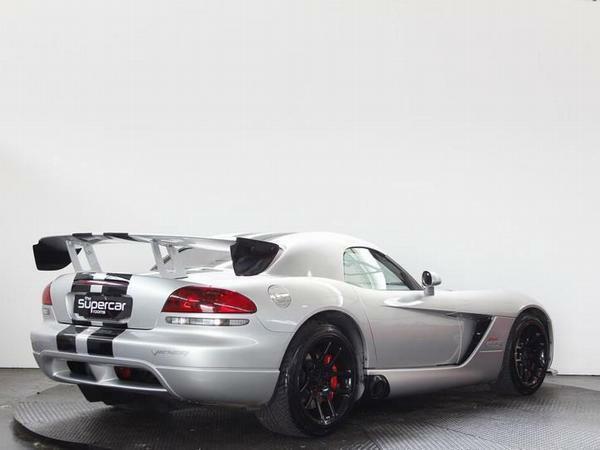 A heavily revamped version of the Viper road car arrived in 2003 wearing a new skin and using a larger, 8.3-litre engine that took the model’s maximum output to 507hp. The use of more exotic materials also meant the lump’s weight was drastically lighter than the old one, tipping the scales at a more respectable 230kg. Along with an evolved chassis, it made the third evolution of the first Viper an entirely different beast – one that offered a more broadly competitive package to really take it to the Europeans. 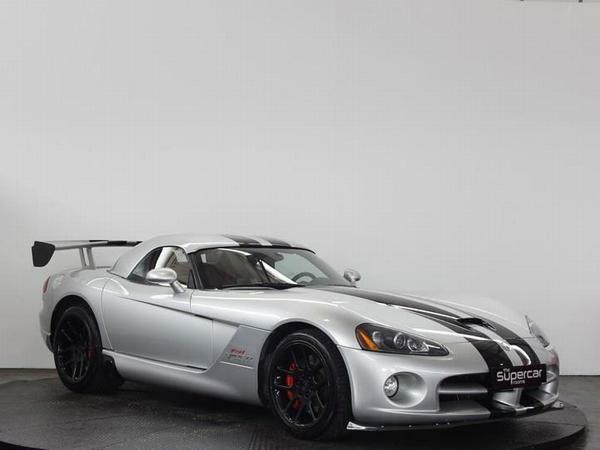 Although it wasn’t until the SRT-10 arrived in 2003 that this Viper incarnation really found its footing. Benefitting from a small bump in power to 517hp, the V10 American was now a 340hp/tonne supercar chaser that could accelerate from 0-60mph in 3.8 seconds and reach a top speed of 190mph. Like many American cars of this kind, those factory-specification numbers represented something of a baseline for tuners eager to get their hands on the then-new model. This was certainly the case with Texas-based Racing Solutions, which developed an RSI 750 package for the 10 cylinder that included the enlargement of that already massive engine. The firm fitted a new crankshaft to increase capacity to 8.5-litres, while new pistons, a forged bottom end and lightweight conrods helped extract 750hp from the motor. It now drove via a lightweight flywheel and uprated clutch through a toughened six-speed manual, creating a ludicrously potent Viper – although, due to the complexity of getting one across the Pond, few non-Americans got to enjoy such a bonkers experience. But this is PH, so naturally one of these mad Vipers is listed in the classifieds and on sale in Britain – albeit as a hard-top wearing convertible. It’s not cheap, with the 2004-built and 2006-registered UK car priced at a fiver short of £56k. But with only 18,000 miles on the clock and what’s claimed to be $35,000 worth of upgrades, including a complete retrimming of the cabin by a specialist in Michigan, and it potentially being one of only a handful of RSI 750 converted Vipers in Europe, you might argue it’s worth even more than the sum of its parts. Don’t you agree? 5 owners and only 18k miles?!?! Is it exempt from London ultra low emissions zone?! Certainly wouldn't see another one coming towards you. What a car it is. No-bulls t-get-to-the-business kind of a car like this Viper is always desirable and it will only become more so going forward. It being a modified version with higher output is icing on the cake as the engine still has plenty more to give. And I suspect it was rather scary putting that power down. Widow maker? I'd retrim the seats. it's quite possible that this IS exempt from the ULEZ tax. One of my favourite phrases, but I think (hope!) they're trying to point out that in the Viper's case, there is a replacement for displacement, with a fairly low output for a massive engine. They're awesome though, love them! Sounds like a bargain to me. I'd love one. I'm sure I saw this in a video with interviews etc as well, but I can't find it now. Everyone disparages the engine as being crap for its size, but it's actually quite sophisticated from the 2nd gen-on for a 2-valve motor. 8.5 litres. Wahoo!! In 5th gear that must out accelerate most things even from 30mph. "He never drives it, Ferris. He just rubs it with a diaper."